Tokyo Disney Sea is spectacular, wondrous, and scenic, and interestingly, it has a plethora of transportation options. 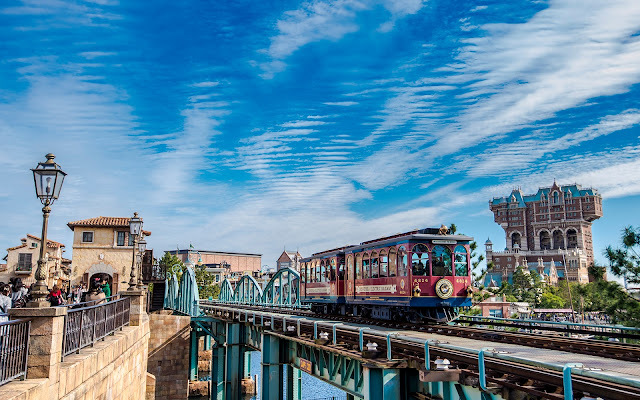 In addition to the active two routes on the Disney Sea Transit Steamer Line and the pretend S.S. Columbia steamship, there's also the Disney Sea Electric Railway, which connects the American Waterfront to Port Discovery. It's a rather short little ride, but a pretty cool little feature, and fantastic photo op. And even though there's nothing necessarily super exciting or high demand, it's a great amenity in the park. So I took a picture of it. The Tokyo Sea Electric Railway cruises along the track through the American Waterfront.